This week for Technique Tuesday, we will focus on ways to keep your organization running smoothly by productive task management. 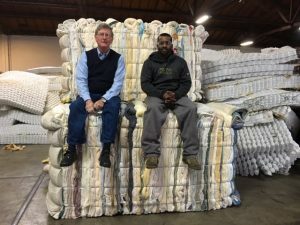 Last week, St. Vincent de Paul director, Terry McDonald, visited one of our mattress deconstruction operations in Stockton, CA. The photo to the left is of Terry and operations manager Al, on the topper bales at Stockton. Al runs a tight operation. Keeping things clean and organized isn’t easy but is key to staying productive when you’re processing 4,000 mattresses a week. Putting tasks off until the end might seem time productive in the moment, but it all adds up and leaves a time-consuming project at the end. It might seem like extra work to keep everything clean and organized, but it’s beneficial in the long run and eventually becomes a routine. Implementing a chore chart into your organization’s structure to make sure every task is covered can be beneficial. Tasks can rotate and if each person in your organization does one or two tasks each, the time saved can be used on productivity towards other large projects or tasks of your operation.